Thae Yong-ho in London in 2015, the year before his sudden defection. | Image: YouTube capture. In the white-hot arena of books about North Korea, for better or worse, readers are accustomed to sensational claims and confident inferrences of what Kim Jong-un and his (invariably brutal) Party-state intend to do. It is therefore a pleasant surprise when a former diplomat from the regime couches his assertions in a certain ambiguous tone. Thae is up front in both his new memoir and many recent media appearances about his relationship with Kim Jong-un. 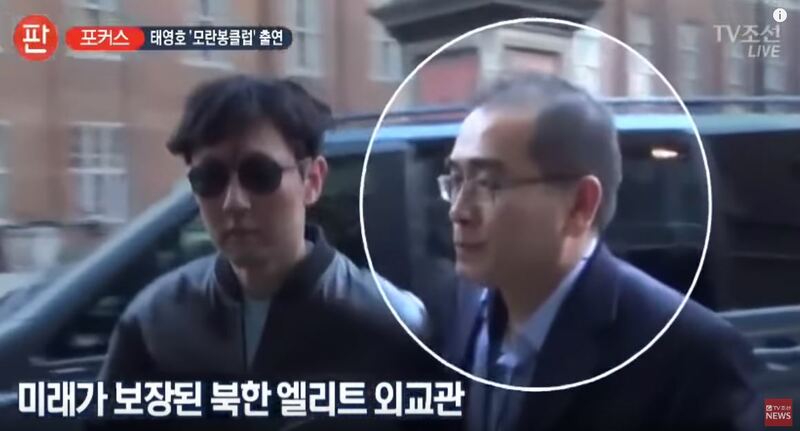 (They have never met, nor does Thae purport to have inside information about the Kim family other than his interactions in London with Kim Jong-un’s musically-oriented older brother). 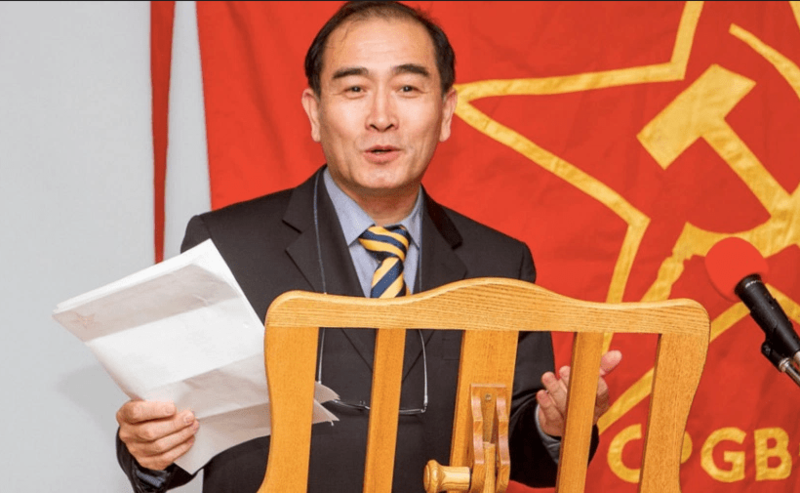 Thae Yong-ho was the Party Secretary in the DPRK embassy in London, but he, too, was under the surveillance of a security officer based in Berlin who visited periodically. The ethos of mutual surveillance will be familiar; I recall watching the slightly nervous face of the Ambassador at the time, Hyon Hak-bong, who, when speaking to a roundtable at a British think tank, forgot a single English word — and looked to Thae, quietly taking notes at the end of the long table, for it. “Corruption,” said Thae in a deep voice. The health of any given bureaucratic body under the control of the Korean Workers’ Party is difficult to assess, but Thae’s experiences at the near-highest level of diplomacy do not indicate as deep a dysfunction there as might be assumed, and which similar memoirs of experiences in the true crisis period of the late 1980s and early 1990s claim. A good example and a kindred book of Thae’s is Kim Chong-ryul, whose Im Dienst des Diktators (In the Service of the Dictator) catalogued years of work for the regime in Austria and around Europe. Kim faked his own death in 1994, escaped from his North Korean post in Vienna with a sum of cash and lived for fifteen in hiding, eating a single egg every day, before actually defecting and emerging in the late 2000s. Cryptography of the Third-floor Secretariat, the memoir of a former senior DPRK diplomat in the UK, Thae Yong-ho. Thae, Yong-ho. Cryptography of the Third-floor Secretariat [3층 서기실의 암호]. Seoul: Giparang, 2018. 554 pp. ISBN 978-8-96523-650-4. 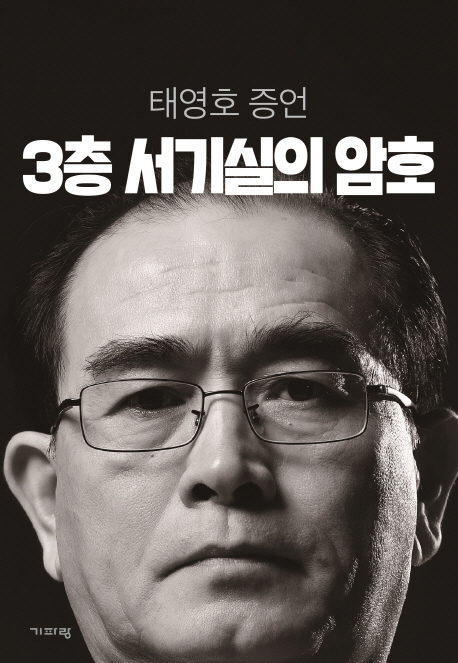 Thae Yong-ho’s book, Cryptography of the Third-floor Secretariat, has attracted the attention of international journalists mainly for its insights into Kim Jong-chul and other stories of North Korea’s ruling Kim clan. In the book’s conclusion, however, Thae explains that this was not his goal: rather, he wrote the book so that South Koreans could “properly understand” North Korean society (p. 509). It is a sentiment that he has since reaffirmed on a newly established blog, expressing dismay that young South Koreans are not interested in unification, unlike (he claims) their brethren in the North. This, in itself, is not a new frustration among emigres from North Korea: many a defector has, through memoirs and occasionally even novels, tried to combat the apathy that South Koreans feel toward unification, and by extension, anything related to North Korea.1)This apathy has more recently come to be tracked by journalists and academics through surveys, and can be explained by a wide-range of factors. Thae’s book, at 500-plus pages, represents a considerable investment in attempting to push back the tide and change the attitudes of book-shy young South Koreans. The likelihood that he will succeed may be low, but in the process of trying he has weaved together a sprawling narrative based on his experiences in North Korea’s diplomatic corps in the twenty years leading up to his 2016 defection. This is the written testimony of a former member of North Korea’s elite; it dives into the successes he achieves as a diplomat, along with the conflicts he comes across both personally and professionally as an English-speaking, globalized representative of one of the most closed societies in the world. Thae devotes relatively little of his book to his upbringing and family. In fact, while many autobiographies typically begin with a description of the author’s beginnings, Thae’s book finally and inexplicably delves into that narrative rather late (p. 416). It feels even odder when you realise that he has an interesting story to tell. He relates that his grandfather was an early supporter of Kim Il-sung, and his father was the first person from his village to go to college. At a young age, Thae was selected for overseas study in China, where he learned English. Later, he attended the Pyongyang University of Foreign Languages, where he studied with children of the traditional North Korean elite, including Choi Son-hui, the stepdaughter of first-generation revolutionary Choi Yong-rim, who is now at the coal face of relations with the US in the Ministry of Foreign Affairs. Overall, his portrayal of his childhood reflects memories of the 1960s and 1970s as the “good old days.” However, Kim Il-sung actually does not figure prominently in the book; by the time Thae enters the world of work in the 1980s, Kim Jong-il has taken over the running of the country and his father is more or less a figurehead. Thae’s early service in the diplomatic corps coincides with North Korea’s economic crisis of the 1990s, otherwise known as the “Arduous March.” Thae’s perspective on the crisis reflects the difficulties and at times outrageous contradictions faced by North Korean diplomats abroad during the period. Thae notes that a lack of operating funds during the Arduous March led to embassies taking extreme measures. He notes, however, that diplomats were not idle in trying to alleviate the suffering of their brethren: by way of example, he shares his own success in convincing a Danish manufacturer of cheese to send massive quantities to North Korea as aid (p. 118). In his telling, however, these individual acts failed to get to the root of the problem. A case in point, Thae dwells on the sense of shame he felt when ordered to procure luxury items for the ruling Kim clan during the same period (p. 102). Bridge to the UK | Thae’s deepest insight into the workings of North Korea’s foreign policy perhaps lies in his views regarding North Korea’s relationship with the United Kingdom. This is where he is best placed to comment, having taken part in important meetings in the run up to the two countries establishing relations in late 2000. Thae highlights how North Korea sought to use the UK relationship as a way to control potential US aggression against the country. This is perhaps most evident in the period leading up to and after the start of the (Second) Iraq War, when North Korea believed — not without reason — that it could be next on the list of countries the US would attack. Thae relates that Kim Jong-il looked very closely at how the UK reacted to potential moves by the US against North Korea and was reportedly “relieved” when the UK made it clear that it would not support American aggressive action. Thae’s actual route of defection is shrouded in mystery. At places in the book he recalls his relationships with British journalists, diplomats and other figures, including former British charge d’affaires in Pyongyang, James Hoare, and former Reuters Seoul correspondent James Pearson, but remains predictably silent on whether he was assisted by the British intelligence services when he decided to flee. Only, he describes the defection as his way of protecting his family from being torn apart. North Korean diplomats are typically at the mercy of the government about whether they are allowed to live with their children while abroad. Though the policy is apt to change over time and depending on relations between the official in question and the Kim family, as a rule one child is forced to stay in North Korea as collateral to prevent defections. Thae had been fortunate enough to live with both of his children in the UK. However, his eldest child was on the verge of being (forcibly) sent back to North Korea as a result of a massive call back of diplomats’ children living abroad in 2016. Thae recalls that he thought “enough is enough,” and after consulting his family, they decide to defect to South Korea. Thae, in some sense, was one of the lucky ones. Hong Sun-kyung, a North Korean diplomat in Pakistan and Thailand, in contrast, was forced to make the difficult choice of defecting without one of his children. Ending in Diatribe | The book’s concluding chapter delves into Thae’s thinking about the Kim Jong-un era and North Korea’s future. This part of the book is perhaps the most emotionally-driven, and is jarring in comparison with the rest of the text. 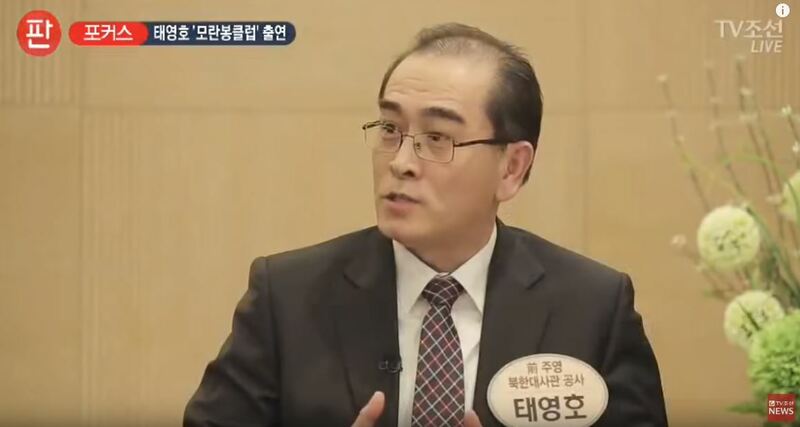 Thae frames his efforts for unification in phraseology common among hard-right South Korean conservatives, saying that he is working “to free the slaves” (노예 해방을 위하여; p. 499). Thae argues that North Korean society was turned into a “feudal society” in the 1970s by Kim Jong-il, and following the death of Kim Il-sung in 1994, that it became a “slave society” (p. 515). The use of this provocative phraseology — which other defector memoirs also tend to use — seems out of place, particularly as Thae also acknowledges the changes occurring in North Korea, including the spread of marketization and the large amount of outside information flowing into the country. Indeed, the last six years have been characterized by perhaps the biggest increase in agency, if only in the economic sphere, that North Koreans have seen since the 1960s, albeit in the context of a political system that restricts basic freedoms to an absurd degree. At any rate, readers may differ in their views on the appropriateness of the term “slave” (노예) to describe conditions for those living in the North. Thae’s predictions about the future of the Kim Jong-un era is similarly wrapped up in provocative language. He describes Kim Jong-un as “rough-around-the-edges and prone to improvisation, but also logical,” (p. 516) but his insight into the leader appears limited given the lack of close interaction. Indeed, the stories he shares about the leader largely appear at the very least second-hand, if not further down the grapevine. While warning that Kim’s biggest concern is his own loss of “charisma,” Thae remarks that the elite are “turning their backs” on the leader and that “officials” do not believe there is a future for North Korea anymore (p. 524). This seems like an unlikely moment for such realisations to occur, given that North Korea has weathered ruinous economic crises in the past and is showing signs of fitful economic growth now. Thae, unlike many high-level defectors, does at least refrain from stating when he expects North Korea to collapse. This is of course for the best, as such predictions are a distraction. Ultimately, his analysis of the Kim Jong-un era emphasizes the more salient point that interpretations can and do vary significantly on what direction North Korea will take. His own views should be taken seriously, but it should also be recognized that his agenda now clearly centers around the fall of the regime. As such, this book, especially its conclusion, must also be taken with a grain of salt. 1. ↑ This apathy has more recently come to be tracked by journalists and academics through surveys, and can be explained by a wide-range of factors.